Black or brown tack for showing? black or brown.. which is best? Brown definately - although you would never get 'marked down' for black tack. Brown looks best on most horses. What colour is the horse you have in mind? But she wants all matchng tack so would black be better? Yeah black does look nice on bays i think. yeah *** horsebabe said.. ok thanks and a plain or colured browband? Brown looks lovely on a bay, and if you're buying new, and plan to do quite a bit of showing, brown is the way to go - it can be used in all disciplines. The only time I'd consider black is on a piebald or true black horse. Agree with Glider, although I'm fairly sure I could find a shade of brown to suit a jet black. 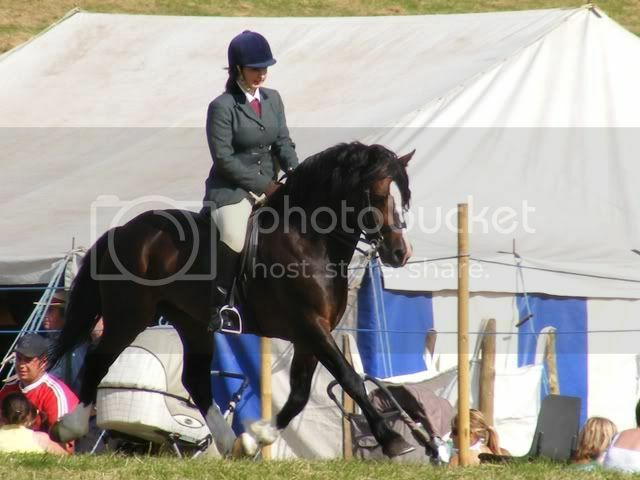 I'm not keen on black tack on bays (or any other colour for that matter), it's quite harsh against the coat. I'm thinking of bays with black points though, as in black legs/main and tail. Do you have piccies of the horse? I nearly converted to brown, but I honestly prefer black. My pony is a bright red bay with black points and black does seem to suit him. I think that most judges would look at the horse first, and the tack and riders clothes second. I would only think it would matter if there was very little to choose between two animals. Vaguely funny story - I was at a show and an saying that I had finally got the dosh for the saddle of my dreams an Albion selecta (second hand). An acquitance then started to bang on about having spent £1,200 (what my pony cost) on a brown saddle as she needed it as she has a reg. cob (unlike mine) and they show county dont you know. She came seventh and we came third which sort of summed it all up really! The correct turnout differs for each class. Some classes a brown bridle is correct and for others black is, but generally speaking it is brown. Although most judges will not penalise for the colour of your tack; Some will. So for a bright bay - who is chestnuty would brown tack suit her? I use black tack on my bay - I think it goes really well with his black points. A judge who would mark down for black tack would not be much of a judge anyway. There are far more important things to look at than the colour of the tack! With a close friend whom is a well respected national showing judge, my post was stating the 'correct' turnout. That is the showing world I am afraid!!! Grand-Prix- brown is always correct, it doesnt matter what class you are doing. black looks nice on the right horse, but either way as long as the tack is clean and shows your horse off to its best (straight cut saddle, right thickness noseband etc) then it really doesnt matter.